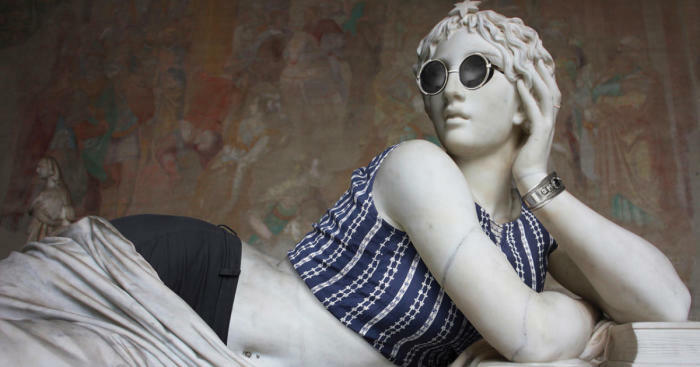 In 2012 French photographer Leo Caillard partnered with the Louvre Museum for a project in which he makes classic statues "wear" modern-day clothing. For the creation of "The Hipsters in Stone" art series, Caillard first photographed the statues, and then asked his friends to pose in the same position but with clothes like jeans, flannel shirts and even Ray Ban sunglasses. Then he finished his project with Photoshop. Here's the second part of the series. Awesome. Even a naval piercing. Amazing how they got the dress fabric to look so natural around the sculpted curls. 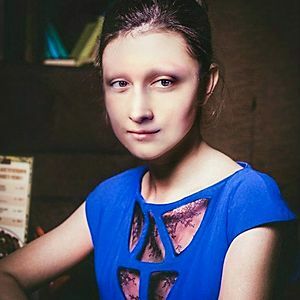 She looks real. "IDK, I just feel so....so....empty. I mean it's like, I defeated Voldemort! No matter how long I live, I'll never top that! I peaked too early." "Me on my lunch break"
Lucy after treading grapes with Ethel And getting in a grape slinging fight. If they these guys WERE in the streets today everybody would turn around to have a second glance on them. That's proves how good the sculptors were. i really enjoy how well edited these are. takes some time, effort, and a considerable eye for detail to be able to get things to match just right. what i am curious however is how many of these are drawn/painted in and how many are photoshopped, if at all. I'm betting they had models pose to match the photos of the sculptures, then photoshopped them like you would any photo to match the physical proportions of the statues, then cut out the clothes, overlayed, and then painted in the gaps.